Connected Cars: What Could Possibly Go Wrong? Millions of cars with tens of millions of lines of code are already talking to servers and each other. According to the Ponemon Research Institute, 63% of manufacturers test less than half of the technologies in your car for vulnerabilities and only 33% train developers on secure coding methods. However, there is a new IT system going into cars that was built with security and privacy by design. This “Talking Cars” safety of life program, which is estimated to save 10,000 lives per year, is one of the few automotive technologies that is secure and private for drivers. This webinar discusses the trade-off between safety, privacy, and convenience. It will also examine the 10-year Privacy by Design system used in “Talking Cars” and how other technology projects can benefit from similar due diligence. 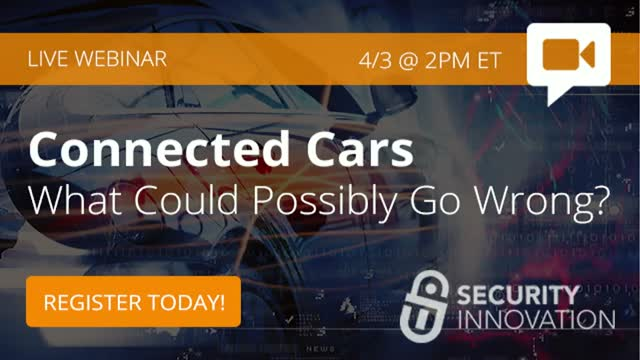 Though basic knowledge of cybersecurity and privacy is helpful, this webinar is for anyone who wants to better understand connected car technology and how to design resilient IT systems. The speakers, Dr. Larry Ponemon and Ed Adams, are experts in their field and deliver this information-rich webinar. In order to address the widening security skills gap, organizations are beginning to investigate non traditional methods for identifying, training, improving and retaining talent. Among the methods being adopted are more immersive experiences that focus on teaching team members how to think and act like an attacker. This approach supplements the traditional engineering “find the bug, fix the bug” focus and enables a much wider pool of talent to become aware, educated and improved. This talk will provide an introduction to simulation environments like Cyber Ranges, differentiate them from gamification systems, and discuss the emerging delivery, adoption and organizational lessons learned that are driving further adoption. Additionally, information will be available to anyone who wants to try a Cyber Range at the end of the session! Blockchain is a promising technology getting a lot of attention these days; however, organizations aren’t entirely sure how it might improve business operations, what the risk implications are, and the security savviness needed to implement securely. • What are the new technologies I need to understand? • Use Cases: where is Blockchain most advantageous? • Snooze Cases: where/when is Blockchain a bad idea? • What are the most common pitfalls with Blockchain? Software runs our world — the cars we drive, the phones we use, the websites we browse, the entertainment we consume. In every instance privacy risks abound. How do software development teams design and build software to ensure privacy data is protected? Attend this webcast to learn practical tips to build software applications that protect privacy data. Understand the requirements of new laws such as GDPR and the impact they have on software development. From executives to software developers and database administrators, each role plays an important part in protecting privacy data. But what does an effective privacy program look like for the teams that build and operate the software applications that powers your enterprise? This webcast will describe how to build powerful policies that can be easily understood and implemented in today’s continuous delivery and DevOps approaches. This Webcast is ideal for policy makers, program leads, compliance managers, and privacy officers. Development and IT Operations teams will also gain valuable insight into how to protect data throughout the entire application lifecycle. * How is privacy different than security? DevOps continues to be a buzzword in the software development and operations world, but is it really a paradigm shift? It depends on what lens you view it through. Roman Garber, an active software security engineering and software team lead thinks so. Ed Adams, Security Innovation CEO, a 20-year software quality veteran and former mechanical engineer, curmudgeonly disagrees. Watch our on-demand session to decide which side of the fence you're on. A widely-used but little known technology has created a vulnerable “Side Door” to thousands of financial institutions in North America. This discovery started with a simple question: why does my bank require multi-factor authentication (MFA), but Quicken does not? This led to an exploration of the 20-year old Open Financial Exchange (OFX) protocol and the 3000+ North American banks that support it. The conclusion: 80% of banks supporting OFX have no MFA support, putting consumers at risk by exposing login credentials. Data breaches happen all the time, but that only happens to large enterprises, right? What about me? How can you alter behaviors to better protect yourself and your family from personal attacks, phishing scams and the like? Join cybersecurity expert, Roman Garber, from Security Innovation for an inside look into protecting your and your families’ personal assets so you won’t become a victim of online threats and breaches. Limited budgets, low-security awareness, and lack of skilled personnel compound problems. Join cybersecurity experts from Security Innovation and Cybersecurity Insiders as they explore the current security landscape and present actionable measures for integrating best practices into your software development process that will help slash enterprise risk. In a world where convenience is key, consumers are adopting every new connected device that hits the shelves - and doing so with the assumption that due diligence security has been considered. But recent IoT attacks suggest otherwise. As organizations migrate from a primarily offline to online business model, they are failing to consider IoT’s unique threats which traditional solutions are unable to secure. As a result, steps must be taken to ensure that the device, connections and infrastructure are hardened, especially software which runs IoT devices and is the source of ~90% of attacks. This webinar is ideal for risk, technology, and security professionals that want to understand why a hacker would want to attack their “harmless” IoT device and what the stealth risk to their organization and consumers is. Did you lock the door before leaving your house this morning? If you did, you threat modeled without even realizing it. Threat modeling is identifying potential threats (house robbery) and implementing measures to mitigate the risk (locking your door). Protecting valuable assets, no matter if personal assets or business-related assets such as the software you are developing, threat modeling should become an instinctual and necessary part of your process. Our talk highlights how nearly 50% of security flaws can be mitigated through threat modeling. We help you prevent and mitigate risks by utilizing a reliable and hard-hitting analysis technique that can be applied to individual applications or across an entire portfolio. We show you how to effectively apply these techniques at the start of the design phase and throughout every phase of the development lifecycle so you can maximize the ROI of your security efforts. When GDPR becomes law in a few months, it will be the most wide-ranging and stringent data protection initiative in history. To prepare for this sea change, most organizations have streamlined and detailed their information security policies; however, many are unaware that immature application security programs arguably pose the biggest threat of a data breach. This oft-forgotten piece of data protection puts organizations at risk of GDPR fines. Attend this joint webinar with Security Innovation and Smarttech247 to learn practical tips on incorporating application security best practices into an InfoSec program to achieve GDPR compliance. What Do You REALLY Need to Know About the New OWASP Top Ten? The OWASP Top Ten is the de-facto web application security standard because it reflects the evolving threat landscape, providing organizations a framework to manage and mitigate application security risk. This dual-presenter format will examine the critical newcomers and pesky incumbents from both an offensive and defensive perspective. Attend to get our expert insight on how to harden Web applications and align your program towards OWASP compliance. Kevin Poniatowski, Sr. Security Instructor & Engineer at Security Innovation, brings an optimal blend of speaking ability, technical savvy, and an insatiable passion for security to Security Innovation's training customers. Kevin entered the application security field in 2007 with Security Innovation, where he has split time between application security course development and delivering instructor-led courses. Mark Burnett is a security consultant, author, and researcher who specializes in application security, authentication, and hardening Microsoft Windows-based servers and networks. Since 1999 he has worked in numerous areas of IT security, developing unique strategies and techniques for protecting critical assets. Mark is author and coauthor of a number of security books and publishes security articles for several web sites, newsletters, and magazines. Applications are the primary target of attack due to their prevalence and inherent exposure, and require a solid defense in depth strategy to reduce risk. This on-demand webinar aims to educate IT and development teams on technologies available to build and deploy more secure software systems and debunks common myths about what each can and cannot protect. The OWASP Top 10 is an expert consensus of the most critical web application security threats. If properly understood, it is an invaluable framework to prioritize efforts and address flaws that expose your organization to attack. Watch this on-demand webinar as Jason Taylor, one of our most experienced security experts, takes us through the journey of identifying the tell-tale markers of the OWASP Top Ten and reveals the techniques used to hunt them down. The OWASP Top Ten is an expert consensus of the most critical web application security threats. If properly understood, it is an invaluable framework to prioritize efforts and address flaws that expose your organization to attack. This on demand webinar presents the OWASP Top Ten in an abridged format, interpreting the threats for you and providing actionable offensive and defensive best practices. It is ideal for all IT/development stakeholders that want to take a risk-based approach to Web application security. In today's connected world, software runs everything - from smart phones to banking applications, cars to home security systems, even refrigerators, garage doors and other every day devices are "connected." Software is everywhere – and unfortunately, it provides the largest attack surface for hackers. We are a cybersecurity company leveraging our deep knowledge of software security to create relevant products and services. Title: Connected Cars: What Could Possibly Go Wrong?